Room identification signs help your visitors know where to go. Especially in a building with many different rooms with different purposes, labeling the rooms is the only way to navigate. 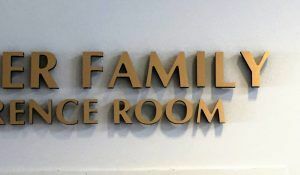 Many offices use room identification signs to label different rooms like the conference room, restrooms, and individual offices. When working with a custom sign company, you can make sure that all of your indoor signage matches. We have recreated existing signs for numerous companies to help keep a theme within the interior decor. We can determine the best materials to use and color match just by having one of our experienced sign fabricators come to take a look at the existing sign. A couple of weeks ago we featured an indoor dimensional letter sign we made for Shomrei Torah. They renamed their gift shop so they asked us to create a new sign that looked just like the existing one they had. 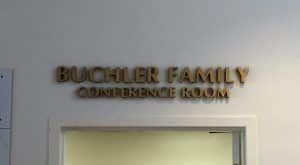 A few weeks later, we created a sign using the same design for their conference room. To make the style identical to the other indoor room ID sign, we routed the letters out of bronze acrylic. Acrylic comes in many colors and thicknesses so it is easy to find acrylic that is perfect for your sign. The dimensional letters have a brushed brass aluminum face so the darker bronze acrylic contrasting with the brass faces creates a great dimensional look. You can see that the existing lighting in the room creates a great shadow effect under the sign. These particular dimensional letters are 1/2″ thick, however, acrylic comes in many different thicknesses so you can customize the thickness depending on how you want your sign to look. These letters were flush mounted to the wall, meaning that there is no space between the letters and the wall. Another mounting option is using stud mounting with spacers so the letters appear to be floating off of the wall. Depending on the placement and existing light sources around the sign, mounting an interior sign with spacers can create a very dramatic visual effect. Dimensional letters are great for exterior, and interior signs. 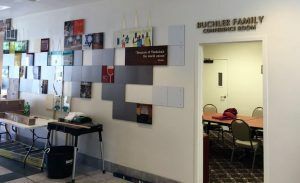 Whether you want them for your building, lobby, or for room identification, the material, size, and color are completely customizable to suit your needs. Check out our website galleries to see other interior acrylic dimensional letters we’ve made. If you’re interested in getting a custom sign made for your business, you can request a quote here.